Osteoarthritis is a painful condition in which the cartilage found in the joints begins to wear away. Cartilage helps to absorb friction between the ends of the bones in your joints. As the cartilage is damaged, bone rubs on bone, causing pain and stiffness. If you have osteoarthritis in your hips and/or knees, you may find everyday activities and sports such as running difficult. However, there are some steps you can take to help. Talk to your doctor to set up a X-ray or MRI in order to fully assess your situation. If your osteoarthritis (OA) is severe enough, you may need to stop running for a while. In some cases you may need to go through a period of physical therapy or even have surgery first to relieve your symptoms. Get your symptoms properly diagnosed to make sure that running will not make your arthritis worse. According to the Arthritis Foundation, there are some general guidelines to help you manage your osteoarthritis so you can get back to the activities you enjoy such as running. Talk with your doctor or physical therapist about using a brace. A proper brace can help to support your joints and take the pressure off so you can run. Losing any excess weight will also help to reduce the strain on your joints when you run. Taking anti-inflammatory medication and using heat and ice therapy may also help you to manage your symptoms. 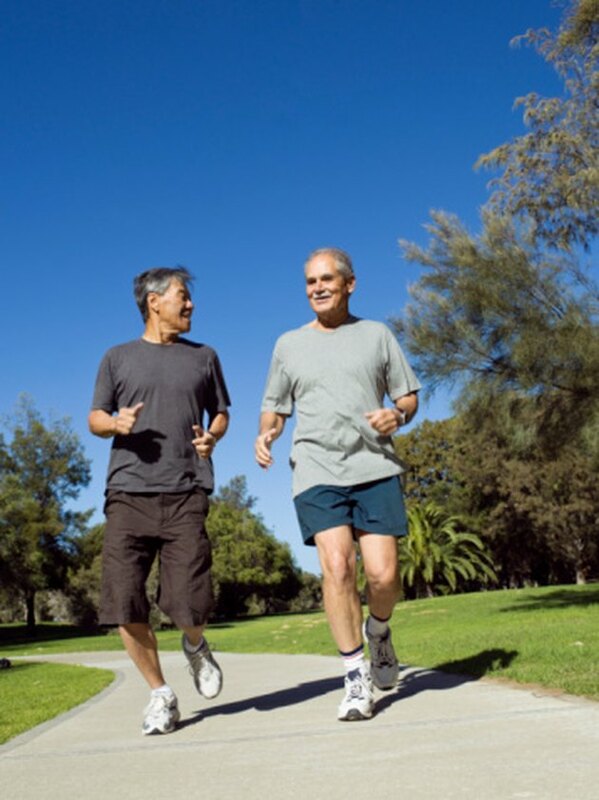 The Arthritis Foundation states that the best non-drug treatment for osteoarthritis is exercise. Running can place a lot of strain on your joints. Strengthening the muscles surrounding your hips and knees will help relieve some of your osteoarthritis symptoms and may allow you to run. Exercises such as squats, lunges, leg extensions, leg presses and hamstring curls will all help. Make sure you also add in some side leg lifts to strengthen the inner and outer thighs as well. Stretching the muscles that surround your joints is just as important as strength training to help you manage your osteoarthritis while you run. When your muscles are tight they can pull on the joints and create more pain. In addition, having osteoarthritis can make your joints stiff. Make sure your stretch your hamstring muscles, quadriceps, periformis and calf muscles. The best time to stretch is right after you run and your muscles are warm. According to RunnersWorld.com, some surfaces are better than others to run on, especially if you are living with osteoarthritis. They place the following surfaces in order from best to run on to worst to run on: grass, wood chips, dirt, synthetic track, treadmill, asphalt, sand and then concrete, which they claim is about 10 times harder than asphalt. In addition, you may want to cross train. Try deep water running during which you wear a special flotation device that keeps you upright and your feet off the bottom of the pool. You then mimic the motions of running with your arms and legs. You get a workout similar to running but without the stress. Does Running Spur Gout Attacks?